"Praxedis" redirects here. For the minor planet, see 547 Praxedis. For the town in Mexico, see Práxedis G. Guerrero, Chihuahua. Saint Praxidis. 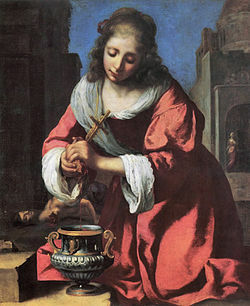 Attributed to Johannes Vermeer (ca. 1655). Saint Praxedes is a traditional Christian saint of the 2nd century. She is sometimes called Praxedis or Praxed. Sabine Baring-Gould, in the entry for Saint Novatus, states that the "holy virgin" Praxedes was a daughter of Saint Pudens, sister of Saint Pudentiana, and that her brothers were Saint Novatus and Saint Timothy. Novatus is said to have died in 151. The remains of Praxedes and Pudentiana were buried in the Catacomb of Priscilla, nicknamed the "Queen of the Catacombs" for its many martyrs and popes. Later, they became associated with a Roman church, Titulus Pudentis, which is presumably named for their father, Saint Pudens, and was also known as the Ecclesia Pudentiana. (This association may have led to Potentiana coming to be known as Pudentiana.) According to the Catholic Encyclopedia, "The two female figures offering their crowns to Christ in the mosaic of the apse in St. Pudentiana are probably Potentiana and Praxedes." In the 4th century, a Titulus Praxedis church was being built, especially connected with the veneration of Saint Praxedis. The relics of Praxedes and her sister were translated to that church, which was rebuilt by Pope Paschal I (817–824), and renamed Santa Prassede. ^ Antoninus Pius ruled from 138 to 161; Marcus Aurelius from 161 on. Catholic Online has "Marcus Antoninus" (that is, Marcus Aurelius (whose full name is sometimes given as "Marcus Aurelius Antoninus Severus") but offers no source for its identification. ^ a b de Voragine, Jacobus (1995). William Granger Ryan, ed. The Golden Legend Vol. 1. Princeton UP. p. 374. ISBN 978-0-691-00153-1. Retrieved 26 October 2010. ^ "St. Praxedes". Catholic Online. Retrieved 26 October 2010. ^ Baring-Gould, Sabine (2009). The Lives of the Saints. BiblioBazaar. pp. 269–70. ISBN 978-1-113-80661-1. Retrieved 26 October 2010. ^ a b "Praxedes and Pudentia". Catholic Encyclopedia. Retrieved 26 October 2010. Wikimedia Commons has media related to Saint Praxedes. Herbermann, Charles, ed. (1913). "Praexedes and Pudentia" . Catholic Encyclopedia. New York: Robert Appleton Company. This page was last edited on 14 September 2018, at 09:30 (UTC).